When I heard about this place in the Times Union a few weeks ago, I knew that I had to go. My friend Rachel who showed me the article suggested that we go last night, and I graciously accepted her offer. The concept: all-you-can-eat sushi for a fixed price ($20 during the week and $22 on weekends). Hypothetically, a twosome could get an unlimited amount of sushi for around the same price as a dinner at Friendly’s…if they skip cocktails. There is one caveat. If you do not finish your food, you are charged the a la carte price for said items. But, you can order as many times as you want, so don’t go in there on an empty stomach like I did and start marking up the order sheet like a dumb kid’s report card. The all-you-can-eat menu is actually pretty extensive. 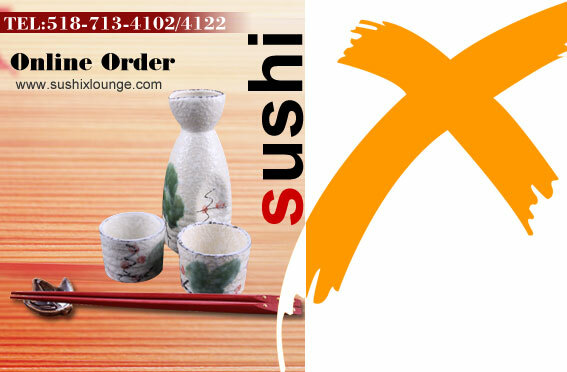 They have nigiri, sashimi, soups & salads and kitchen food (katsu, gyoza, wontons, etc…). I wish I had a picture but neither of us had eaten since around noon, so we dutifully pounded an order of pork katsu, some gyoza and shared a vegetable udon. All were very tasty. I know I was hungry, but I’m pretty sure I only took two breaths in that five minute period; the rest was all swallowing. I actually was able to get a picture in before going to Pound Town (population: 2). 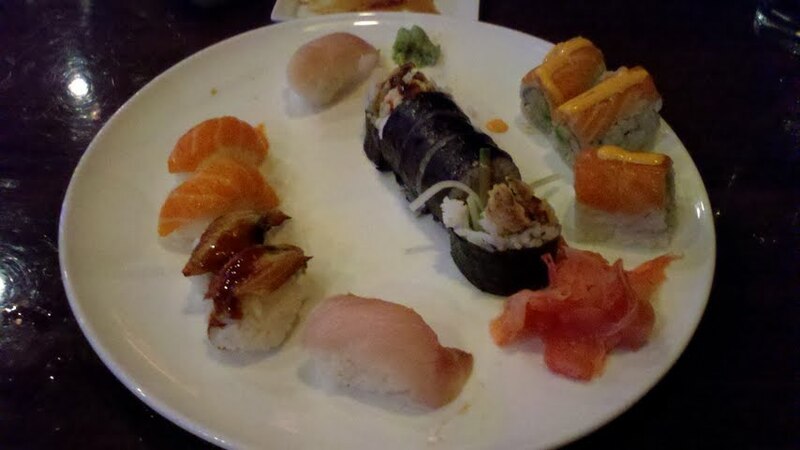 From left to right: Philly Roll, Tiger Roll, “X Roll” (middle) and Crazy Girl Roll w/ 4 pieces of eel and 2 yellowtail. Rachel, coming off a half marathon this past Saturday and myself, coming out after a fasting monk workday absolutely slammed Round 2 and had ordered Round 3 before the ring girls were able to circle the restaurant with the round card. I again let my hunger get the best of my memory and myunched half the plate with Rachel before I took a picture. Trust me, the plating was gorgeous before the mau-ing. 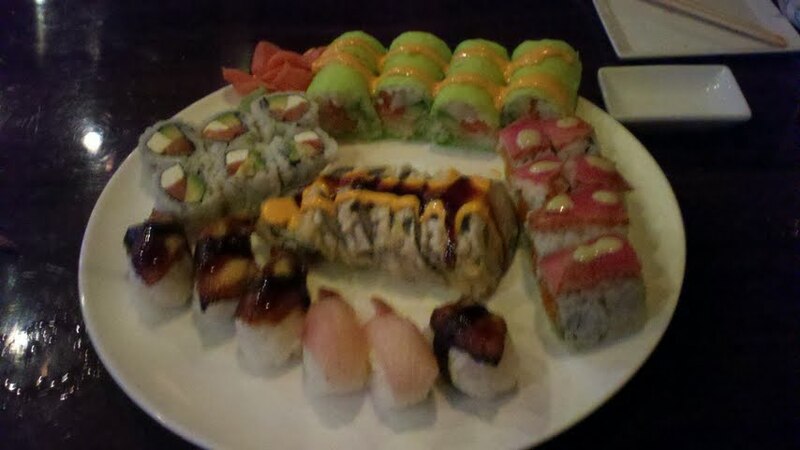 A Spider Roll, a Sunshine Roll and 2 salmon, 2 white tuna, 2 more eel, 1 red snapper and 1 shrimp. 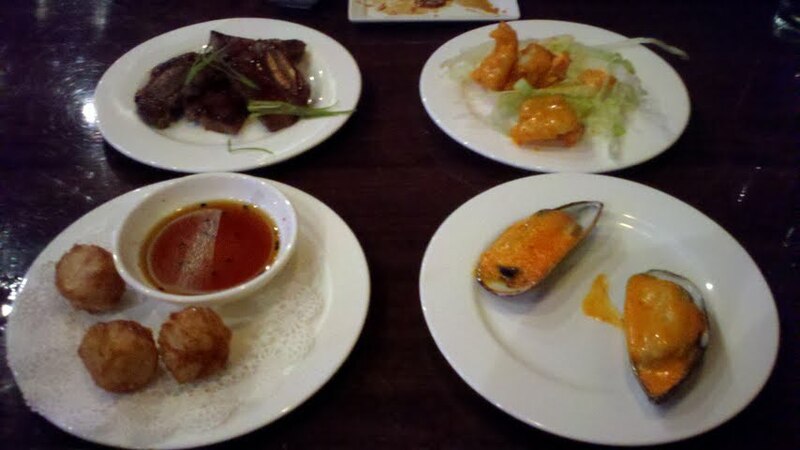 After consulting our bored, yet very charismatic waiter (it was late on a Monday night after all), we ended up with the inflated order of beef ribs, rock shrimp, shumai and baked mussels. Rachel, the trooper that she is, ate just less than half of Round 4 and politely asked for me to bat cleanup. I swallowed the last few bites like a head-pumping tortoise. The two of us decided to forgo dessert since we had reached “uncomfortably full.” They did offer a variety of ice creams, including green tea and red bean which I love. We came very close to splitting a green tea since it was free, but I was already fading fast: the Terri Schiavo of sushi. I’m fairly certain that Rachel and I consumed 800% of our daily sodium thanks to the soy sauce; we’ll be retaining water for the next three months. Whatever. She ran over 13 miles on Saturday and I woke up drunk both mornings this weekend, so we’re good. After some quick calculation I determined that we ate approximately $150 worth of food if we were to have ordered it a la carte. I would highly recommend this place. Out of everything we ordered, the only roll that was sub-par was the Spider. There was an automatic 16% gratuity, but Rachel and I left a few bucks behind because the waiter complimented Rachel on her nails and my water was refilled every five minutes as it seems to be in any Japanese restaurant. If you are going to try Sushi X, make sure that you go with friends who don’t judge (i.e. not a date restaurant).